Discussion [Help] lab 34.1 Glitch group permissions or inheriting permissions affecting folder access? 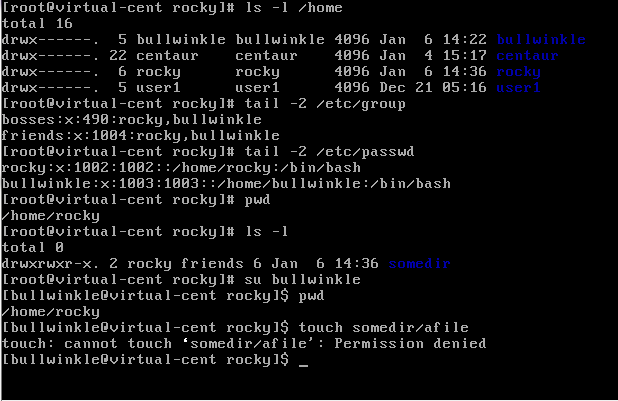 After creating the users and groups at the end of the lab even after adding bullwinkle to the bosses group and giving group ownership, bulwinkle still cannot create a file under the somedir folder. PS: at first I thought it had to do with the guid number so I changed the ownership to friends to test if it worked. borks because group 490 belongs to libvirt; the lab must have been developed on a system without libvirt. So just drop -g 490; it is totally un-needed anyway, I don't know why it was put there. In the solutions, file creation fails after step 5 but works after step 6 (as it should). I deleted them and I tried again with groups > 1000 and I still get the same error. I guess that if in exam date there is no such a glitch I will be happy. The groups greater than 1000 was not the problem. The reason 490 was excluded had to do with libvirt. There was no need to use the -g option at all, I don't know why it was in the lab except to show how to set a group number. i.e., use userdel and groupdel first.